Happy Halloween!! Our friends had a BYOP party a.k.a.... Bring Your Own.... Pumpkin! Unfortunately I had a bad upper respiratory infection and we weren't able to go as I barely moved from the couch all weekend... miserable when I had so many things I wanted to do. And that whole feeling awful part too. I still really wanted us to carve our first pumpkin together so once I started feeling better this week we grabbed one and carved it up! I remember watching my mom carve our pumpkins for halloween as a kid.. once I made her do some complicated scary design I found. She wasn't sure it would end up working but it turned out great. And then we would eat toasted pumpkin seeds YUM! 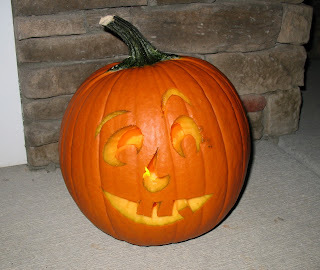 Here is what we did to carve a wonderful pumpkin. I picked out a design here... they were free and had a lot to choose from. We cut an opening in the bottom of the pumpkin... that's right I said bottom, not top like you might expect. This makes it easier to put in a candle and repeatedly light it/blow it out OR in our case switch on and off the fake tea lights :) With the old method you have to reach your arm into the pumpkin top making it more difficult. We did this using our big chopping knife since it would take forever with the pumpkin saw. When cutting the opening we cut a notch so we would be able to pull the bottom out easily. Then you scrape out all of the insides (stringy stuff and seeds) while separating the seeds if you would like to make Toasted Pumpkin Seeds (super easy - post on that coming soon). Now you are ready to carve. 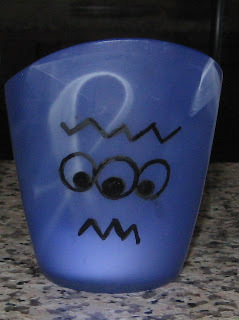 Print out your desired design and tape it onto your pumpkin. We only realized this after but it is much easier to tape it flat if you cut it down... duh! Take a toothpick and make holes in the outline of your design where you would be cutting. The more close together the holes are the easier it will be later to cut... we did them about 1/4 or so apart. This creates a stencil on your pumpkin when you pull off the paper to use as a guide for cutting. Now cut your design along the holes. You can do a little trimming at the end if necessary. We bought a little pumpkin carving tool set at walmart for $4 which made the carving and scooping a cinch but you could get away with using a kitchen serated knife and big spoon if necessary. Meet Pete the Pumpkin! I think he is so cute and a perfect first pumpkin for Eric and I! He looks fan-flippin-tastic on the front porch! It took like a bazillions shots for this to come out right since the fake tea lights "flicker" just like a regular candle and it was quite dark. Katie and I had another craft day a few Saturdays ago. Last time we made Name Blocks and this time we wanted to make fall wreaths. 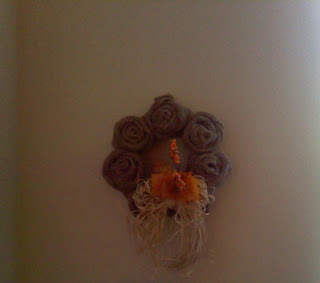 We used this tutorial that I posted awhile back from when my mom made a burlap wreath... hers had shells for summer. Katie only had a 12 inch wreath instead of a 14 inch so she adapted the tutorial and just made 7 rosettes instead of 8. We found our fall flair at michaels for 40% off! We had a fun morning and the wreaths took a few hours with us chatting too so perhaps it could go faster if you were focused. We were a little intimidated at first but it proved to be pretty easy and we got the hang of doing the rosettes! Sorry this first picture below is so blurry, it's from Katie's phone. Her's turned out great and is hanging in her living room. ﻿I realized it didn't fit well under the wreath hanger hook so I just attached it underneath the hook with some twine. So as you can see the burlap wreath works great for many seasons. I love how mine looks on the front door! On another note, I never realized how much I love our green front door. When we were picking out things at the design center (boy that was a ton of decisions in a short amount of time), Eric and I both immediately agreed on the green door... not too dark of a shade and not too light either. The lady there said good choice... green is for life.... perfect... I did want my house to be full of life :) AND it goes with every season! I never realized it at the time but how many colors can really pull off looking like summer, spring, fall, and winter. Green is the only one I can think of. Many colors go with 3 seasons but not with all 4... bonus! Boston has been on our list of places to visit for awhile. At the beginning of Oct we made a long weekend trip up there and our friends Chris and Carla met us there from NY!﻿ I found a nice 1B/1Ba condo with pullout couch on VRBO for the 4 of us to rent that was close to a couple different subway lines and seemed like a nice area... and it was! It was in the South End area close to Back Bay and Prudential T lines. 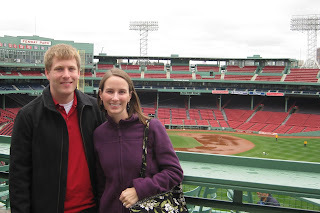 My college friend Mary Ellen now lives in Boston and gave us some suggestions for our trip. We took a taxi to the condo because it was raining cats and dogs. Eric and I had an adventurous walk to the grocery store once we arrived and were soaked by the time we got there.﻿ Thankfully that first night we all ate pizza at this place that was.. no lie directly across from the condo. It was yummy and I was so hungry I think that made it even better. Obviously I took this picture the next day. ﻿Saturday we went for breakfast at a place Chris had been to before called Flour. It was packed and to me that is always a sign it will be good. I had a scone and Eric had the french toast - we recommend those! It was a really gorgeous sunny blue sky cool but not too cool kind of day and so we set out for lots of sightseeing. First we took the T over to Harvard. ﻿The campus was really pretty with brick and stone buildings and mature trees not to mention the fact that you are thinking wow this is really Harvard! We then decided to pretend to be students in an unlocked classroom :) I recommend a subway ride over to Harvard if you are in Boston. Next we visited MIT. This has to be the oddest architecture I've ever seen but kinda cool. There were some nice lawn areas near some classrooms sort of like bowman at Clemson only smaller. But there was no one out there on this gorgeous Saturday... I'm sure they were all studying or watching football yeah definitely studying... those smarty pants... I guess someone has to work on all those tech gadgets we love. We did some more walking around across the river and then headed toward the North End for lunch at Faneuil Hall. ﻿﻿We did some more exploring around the North End and saw Paul Revere's House, Old North Church and sat by the water in a park and enjoy the scenery. We went back to the condo for a little relaxing. Then that evening we went to eat dinner in the North End at some italian place. It was so nice to just hop on the T to go everywhere. Eric and I thought our dinners were just okay but Chris and Carla liked theirs so it may be a hit or miss depending on what you get. There are a ton of italian restaurants in that neighborhood... literally a few on every block. Then we went to a bar to see some football before meeting up with one of Chris's friends to go to another bar. To get to the 2nd bar we walked at least a mile after getting off the T and let me tell you at the end of the night my feet were DYING! No exaggerating. And honestly I have no problem doing a lot of walking but perhaps that day was too much with that last bar hike. Sunday we walked from our condo to Boston Public Gardens and Boston Commons- it was closer than taking a subway there. It was chillier and cloudy that day but I guess every day can't be like that sunny day we had on Saturday. We spotted some kids playing Quiddach.. and SERIOUSLY playing and practicing and talking strategy. I had no idea it had caught on like that... my kids at CTY camp where I was an RA used to play it too now that I think about it. Seemed kinda nerdy but at least better than sitting inside playing video games or something. Monday was even chillier and quite windy but nevertheless Eric and I set out for some Boston activities. We took the T in hopes of riding it out to see Boston College but quickly realized we didn't have enough time to go that far so we got to see Boston University from the T instead. Then we went to Fenway for a tour of Fenway Park. This was one of my favorite Boston activities and well worth the $12. I am not even a Red Sox fan or even really big into pro baseball but the tour was fantastic. It was neat to learn all of the history of the ballpark and walk around and sit in the seats etc. The tour guides are very knowledgeable and make it interesting. Definitely do this tour. Seriously. Even if you hate baseball. Just do it. Later that afternoon we took the T to the airport to head back to CLT. It was quite easy and already paid for since we had passes - you should definitely just take the T everywhere in Boston. We had a wonderful weekend with friends and enjoyed another destination on our list! And we would definitely go again, Boston was a great city! My godmother made these dryer vent pumpkins years ago and I had a couple of them and wanted to make some more for our house and for a gift for a friend. Back when she made the pumpkins, plastic dryer vent was used but now I believe that is some sort of fire hazzard so now it is aluminum. These were hers. And now I'll tell you how to make them. I bought some 3 inch and 4 inch dryer vent duct for the project and I already owned paint, brushes, wire cutters, and a glue gun. I just experimented to see how long I needed to cut the dryer vent. When I made it into the pumpkin shape I would overlap some of the "wire" parts and make them fit inside each other because I did not want a really wide pumpkin and I liked them more round like my godmother's. This was not as successful with the 4 inch duct because it was much harder to overlap and get it to glue gun shut. If you click on the picture you can see what I mean by overlapping. I did get a tad frustrated trying to hold them and glue so a helper would be a good idea. Some of my 4 inch ones popped apart and in the end only 1 of those survived. I added a few staples using a very small stapler just in case any others decided to pop apart. I p﻿ainted them all with dark green craft paint first so they would have some underlying color and look more like real pumpkins look. Then I painted over them with orange, white, and yellow craft paint for the top coat. Painted did take some time since I had to do a few coats and make sure no aluminum was showing through. ﻿Then I hot glued some sticks that Eric found in the backyard and cut for me. I added a couple of leaves from the dollar store to each pumpkin with hot glue as well. I didn't end up tying rafia around them but you could. You can see the green undertones well here. Here they all are after I finished gluing! I sent the 3 on the left to one of my best friends as a gift. I decided to put mine by the fireplace in a grouping. I think the yellow one is my favorite! Mine aren't quite as nice as my godmother's because I think plastic would be much easier to work with but still not too shabby. This was a fairly easy (once you get a hang of the overlapping and gluing part) craft and definitely not many materials needed. The duct comes pretty long so you could make a lot of these (I still have plenty left). Let me know what you think! This is one of my favorite new earring types I have made - beaded teardrops! -beading wire - I use Beadalon .018"
Count out as many beads as you want for each of your teardrops and string them onto the wire. You can try out different amounts and bend the wire to see what it would look like. Cut the wire leaving space at both ends. Hold the 2 ends together so it looks like the teardrop shape and feed the 2 ends into the same end of the crimp bead. Take your little metal teardrop and feed only one of the wire ends up through the metal teardrop and back down into the crimp bead. At this point you really have 3 metal wires in the crimp bead. 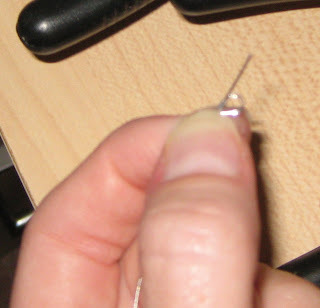 Pull the wire tight so you have a very small loop -this part can be a bit tricky (one end will be sticking out of the top of the crimp bead and the other end will be sticking out of the bottom). Use your crimp tool to clamp down tightly on the crimp bead until it is crimped. Trim the 2 ends of wire as close as you can with wire cutters. I made mine orange for Clemson games of course! These make great gifts as well especially since you can personalize them in whatever colors and size you desire.